If you’re someone that enjoys spending an afternoon playing golf, that awful wait to get on the course can be unbearable. Those who live in colder environments often have to go months without stepping onto the green. It’s a yearly cycle that golfers just have to deal with. The worst part about it is that many golfers see their skills diminish in this time frame. The game requires years to master, so why go through months of not playing if you don’t have to? 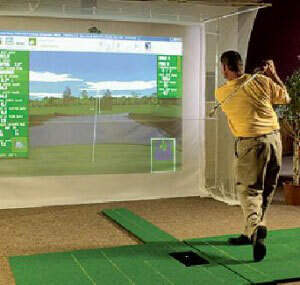 Indoor golf simulators are a great piece of technology that allows you to play the game year round at your own pace. Golfers are out of the sun and in a comfortable room improving their skills one swing at a time. 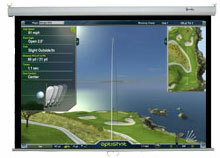 The amazing technology is incredibly accurate and provides golfers with a realistic playing experience. 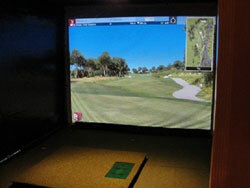 While some golfing facilities have indoor simulators, they can be costly to use. Luckily, it’s easy to create a set-up in your very own home with a bit of creativity for under $1,500. These home set-ups are affordable yet effective. They’re not professional systems. However, they are superb for honing your skills in the comfort of your own space. Instead of shelling out upwards of $50,000, you can easily create a functional and fun set-up on your own terms. With just $1,500 you can get high-quality components and full control of your simulator. Golf simulators, while seemingly complex, are mainly comprised of 5 parts. To get the most bang for your buck, you can purchase all of these components separately. They’ll work in tandem to create an enjoyable golfing experience at home. The actual golf simulator is the brains behind this operation. Essentially, the simulator is a computer that handles all of the technical work. It creates the photorealistic courses and utilizes a number of sensors to track the ball in the three-dimensional space. This component displays the information received from the simulator. Projectors create larger-than-life images to provide a truly immersive experience. They’ll display the images of the course as well as swing information. It’s a crucial part of the setup that will allow you to see what you’ve done and learn how to improve. A screen is needed to provide a crystal clear image from the projector. Similar to those used in movie theaters, projector screens are specially made to reflect light for a brighter and cleaner image. Some are designed specifically for simulators and act as a net that catches the golf ball. Nets are used to catch a flying golf ball and prevent injury or damage. They must be durable enough to withstand that constant barrage of golf balls. Nets are usually made of large mesh and placed in front of the projector screen. 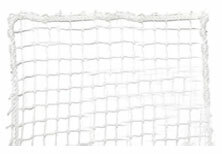 The mesh is small enough to block the ball but large enough to allow visibility of the screen. Golf mats provide you with that realistic green feel. Designed to simulate real grass, these large mats are capable of holding tees and have a similar cushion. They also help protect the flooring below from clips of the golf club. When planning on setting up a golf simulator, the right space is crucial. It’s important to get a space as big as possible. You must consider the size of the required gear as well as room to swing without causing any damage. This space needs to be free of other items, so using a shared space with another piece of entertainment gear isn’t recommended. A chosen space should be longer than it is wide. The width of the space will be taken up by the projector screen. A 10-foot wall is recommended. When it comes to length, the more the merrier. At least 15 feet will provide you with enough room for all of the simulator components and swing space. Height is often overlooked. However, you need at least 10 feet or more to have enough clearance for your swing. Basements are a great place for the simulator. It’s out of the way and generally large enough to accommodate a large set-up. However, it’s important to measure the ceiling height. The minimum code in most areas is 7 feet. Some simulators require less than 10 feet, but it’s a good idea to safely test your swing beforehand. Another great space to take advantage of is the garage. Most garages are fairly tall and spacious. If you are using the garage to house a car or other equipment, you can easily designate one side for your simulator. For added security, you can section off the garage with extra supports or a wooden enclosure. If not, the net and screen will contain your shots and avoid any damage. How Much Will It Cost Exactly? The cost of a golf simulator can vary dramatically based on the separate price of components. Luckily, there are a number of high-quality options that are quite affordable. If you want to stick to a $1000 to $1500 budget, these pieces of equipment are ideal. Golf simulators are very advanced pieces of equipment that can cost thousands of dollars. As the heart of your set-up, it’s important to invest in a high-quality model that will provide years of use. Without an excellent simulator, you’ll be swinging balls into an empty screen. With that being said, you don’t have to spend thousands to get a superior model. When it comes to simulators that don’t break the bank, we recommend these two options. They provide a realistic experience, beautiful graphics, and the ability to learn and improve. 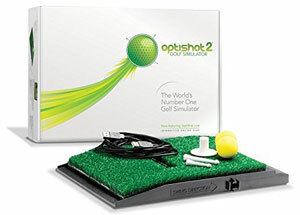 The OptiShot 2 is one of the most popular options due to its numerous features and low price tag ($304). It connects to a personal computer and can feed graphics to a projector or any other screen. It has a number of real playable courses located all over the world. The swing pad is equipped with infrared sensors that measure various aspects of your swing. This information is displayed alongside the scenery to help you get better. You can use your own clubs and balls to swing from the turf pad. If you don’t feel like using a real ball, you can opt for a soft foam option or switch to a ball-free mode. It’s a budget-friendly choice that’s fun and informative to use. This simulator from P3ProSwing is a bit pricier ($799) but offers superb measurements and full customization. 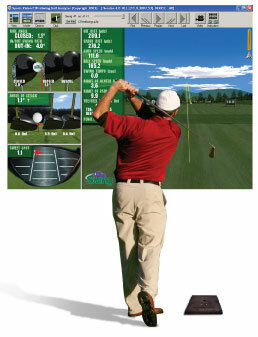 The golf pad is packed with optical sensors that collect data at every point during your swing. You can see information about your swing before, during, and after impact with the ball. Speaking of which, the simulator allows you to use real balls, foam balls, or no ball at all. It comes pre-packaged with three courses. However, you can upgrade and add numerous extra courses to further challenge yourself. If you’re feeling competitive, the simulator allows you to play against other players around the world through an internet connection and subscription. To make the simulation seem as realistic as possible, it’s a good idea to invest in a quality projector. While a regular television can be used, projectors provide a panoramic view of the course. There’s a wide range of options that go up into the thousands. However, these beamers are great for simulation and cost under $500. 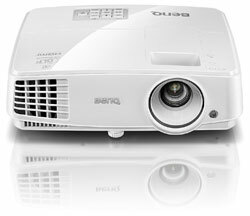 At 3,300 lumens, this projector from BenQ is bright enough for quality simulation. The bright projection makes colors appear brighter and more crisp. It also has a high contrast ratio of 13,000:1. This creates high-definition quality and prevents unpleasant blurring. This option from Epson is small, compact, and very easy to set-up. It has a variety of connection ports, so you can rest assured that the simulator you choose will be compatible. Projector Screen, Impact or Regular? 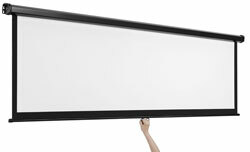 A large and reflective screen will complete your projector setup. 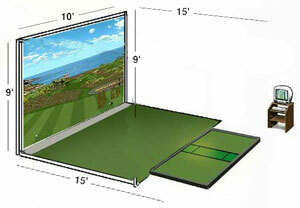 Projector screens are ideal for golf simulators because it provides a huge view of the course. It also adds to the illusion that you’re hitting the ball into the screen and onto the green. This is a unique option that’s perfect for golf simulation. Not only is it a superb for producing crisp images, but it also acts as a net. It’s an impact screen that can take the impact of a golf ball without any damage whatsoever. It replaces the need for an additional net. This VonHaus screen measures a large 100 inches, allowing you to see more information and scenery. It’s matte in appearance and has a gain of 1:1. This means that it has relatively low light reflection capabilities. For added contrast, there’s a black border around the perimeter. A metal case and bracket system make attachment to the ceiling or wall simple. The best part about creating your own golf simulation set-up with a variety of carefully chosen components is that you get to make it your own. You can make it as big and customized as you want. Simulators come in all shapes and sizes. With these affordable pieces of gear, you can create an awesome system without breaking the bank. An indoor golf simulator will allow you to play your favorite game anytime you want. The accurate measurements will help you get better with every game you play. When it’s time you hit the real golf course, all those simulated games will prove to be useful.